I had so many questions about wall-mount faucets before I chose to install one in my bathroom. Questions such as: how to repair the faucet if something goes wrong, how expensive they are to install and where to place the faucet on the wall. If you have these questions as well, perfect! I’m sharing all I learned today. 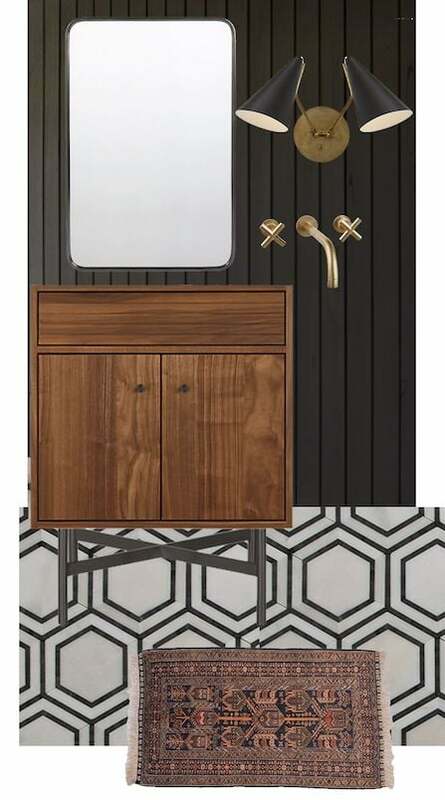 Just to remind you, since it’s been awhile since I shared my powder bathroom plans, this is the look that I was going for. As you can see, I wanted to install a wall-mount bathroom faucet over tile or black shiplap. 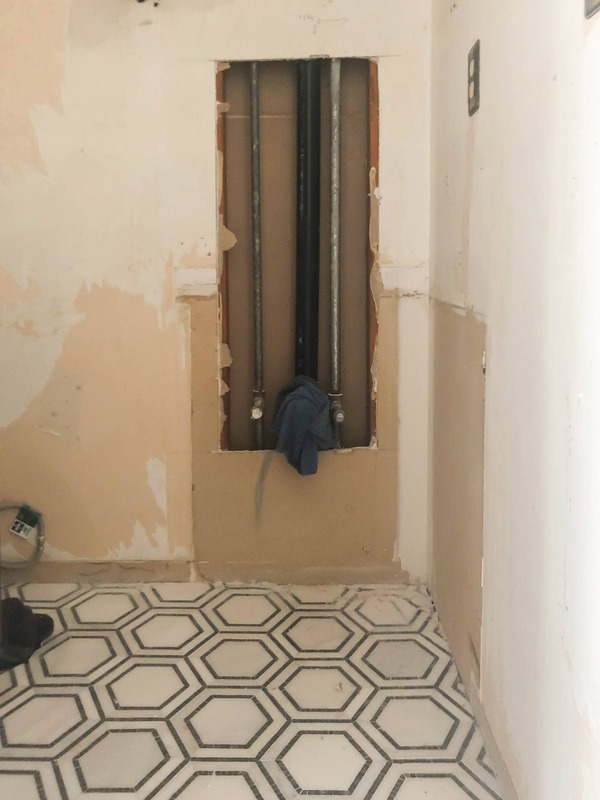 Step 1 for this project was to get the flooring in, because the flooring affects the height of where to place the faucet. So, we got the flooring in! How do you place wall-mount faucets? Have your flooring in place. This gives you a starting point for your measurements. Have your vanity and sink picked out and, if possible, available in the space to visually make sure you like what you are going with. Decide on your faucet spout (straight or with a downward curve). Have the faucet in the space to help determine height of faucet on the wall. Hold the faucet up to the wall to see what visually looks good as well as what will be functional for washing your hands. For my faucet and and under-mount sink, 9″ above the vanity was a really good place to wall-mount the faucet. The faucet and parts that I ordered were all Kohler because they had the longest spout available. Here are the exact parts that I ordered, in case you are interested. Are wall-mount faucets more expensive to install? Yes! They are more expensive to install and are also more expensive to buy. The issues with a wall-mount faucet is that they have to have the piping and sink drain in the right spot. If they aren’t in the right spot, then they have to be moved. If you are installing a wall-mount faucet, expect to face some issues when you open up the drywall to expose the plumbing. You won’t know what the issues are though, until you cut the drywall to see behind it. For us, this is where we ran into major problems. Our house is a split-level with four half floors. Directly above the powder bathroom is the main bathroom. So, our plumbing (hot and cold water lines and drain) in the powder bathroom are running up to supply the main bathroom as well. To reconfigure the lines and the drain, we would have to take off the majority of the bathroom wall and the ceiling. Taking off the ceiling runs into another issue because we have asbestos in our popcorn ceiling. I shared all about asbestos abatement and cost a few years ago, but if you aren’t familiar with it… it’s expensive. Our plumber said that because of how the lines were ran and because the master is directly above, a floor joist would probably have to be cut as well. At this point, the quote went from about $200 (to install the wall-mount faucet by itself) to about $3k (rerunning the pipes, asbestos abatement and redoing all the drywall). At this point, I was on the fence to be honest. I really love the look of the faucets mounted on the wall BUT that cost is pretty high; especially since you don’t really know exactly what’s above the ceiling until you get to it. Another thing that factored in to this was..
How do you repair a faucet mounted on the wall? To repair a leak with a wall-mount faucet, you have to get behind the wall. Since we were tiling the wall, we’d probably not ever notice a leak unless we put a sensor in or the leak was bad enough to show on the floor or something. When my plumber told me this over the phone before I knew about the whole plumbing line issue, I wasn’t that concerned. We were hiring a professional and had bought quality plumbing parts, so I was ok with taking the risk. BUT, ultimately, after discovering the issues with our plumbing lines and combining that with the thought of what it would take to repair the faucet if it leaked, I think we are going to pass on installing it. I’m pretty darn disappointed, to be honest. I love the look but I don’t think I want to spend $3k just to have the look of a faucet overhanging my sink. I’d rather invest that money in new windows in the basement or sunroom.